House Democrats are fighting back after Republicans squandered millions of taxpayer dollars in a partisan effort witch hunt to attack a presidential candidate. As one of the longest and most partisan congressional investigations in history, the Benghazi Select Committee’s actions serve as a case study in how not to conduct a credible, legitimate investigation. 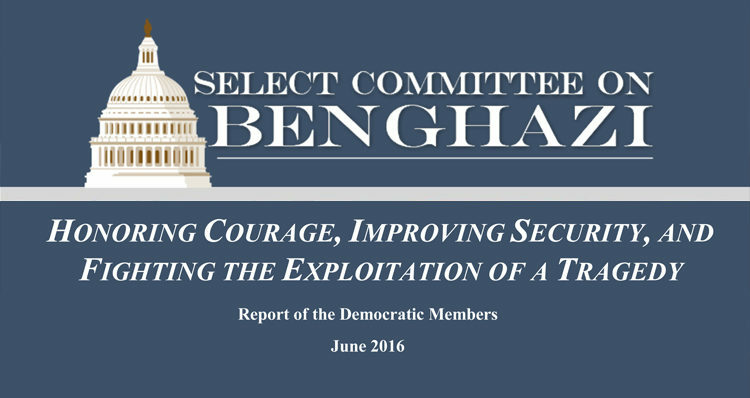 The Select Committee broke the promise it made to the American people to address the attacks in Benghazi in a fair and balanced manner that would lead to improved security for Americans serving overseas. public, the men and women who serve our nation, and the families of those who were killed during the attacks. In order to create a historical record for Congress to consult before establishing any future select committees, the abusive and improper conduct of Republicans on the Benghazi Select Committee is set forth in the examples below, from A to Z.
Click on each entry for detailed information regarding misconduct on the part of House Republicans. A. Republicans admitted that their purpose in establishing the Select Committee was to attack Secretary Clinton’s candidacy for President. B. Republicans targeted Secretary Clinton from the beginning. C. Republicans proceeded with no Select Committee rules. D. Republicans proceeded with an unlimited timeline and budget. E. Republicans refused to define the scope of their investigation or identify the questions the Select Committee was trying to answer. F. Republicans abandoned their own hearing plan to focus on Secretary Clinton. G. Republicans excluded Democrats from interviews and concealed exculpatory evidence. H. Republicans selectively released Sidney Blumenthal’s emails after proclaiming that “serious investigations” do not make selective releases. I. Republicans subpoenaed Sidney Blumenthal to conduct political opposition research that has nothing to do with the attacks in Benghazi. J. Republicans blocked the release of Sidney Blumenthal’s deposition transcript showing numerous questions about the Clinton Foundation. K. Republicans leaked inaccurate information about Cheryl Mills’ interview, forcing Democrats to release her transcript to correct the public record. L. Republicans began withholding interview transcripts in violation of House rules to retaliate against Democratic efforts to correct the public record. M. Republicans inaccurately accused Secretary Clinton of compromising a covert CIA source. N. Republicans held an 11-hour hearing with Secretary Clinton that was widely condemned even by conservative commentators. O. Republicans inaccurately inflated their interview numbers to counter criticism of their glacial pace. P. Republicans inaccurately claimed the State Department had not provided a single “scrap” of paper. Q. Republicans inaccurately claimed that no other committee had ever received Ambassador Stevens’ emails. R. Republicans issued a unilateral subpoena to retaliate against the Department of Defense for exposing the Select Committee’s abuses. S. Republicans exploited the attacks in Benghazi to raise money for political campaigns. T. Republicans threatened to withhold $700 million in State Department funding supposedly to speed up document production. U. Republicans ignored a letter from 33 current and former U.S. ambassadors explaining how the State Department actually works. V. Republicans abandoned the Select Committee’s final two hearings on improving security. W. Republicans took a costly and unnecessary congressional delegation to Italy and Germany. X. Republicans used taxpayer funds to conduct one of the longest and most partisan congressional investigations in history. Y. Republicans drafted their partisan final report in secret with no input whatsoever from nearly half of the Select Committee’s members. Z. Republicans forfeited any credibility by delaying their report until the eve of the presidential conventions.